Handapanagala village is situated 15 kilometres south of the town of Wellawaya in Monaragala District. Until 2012 its population of 1369 inhabitants (434 families) relied entirely upon a small, non-permanent well for all water supplies. Handapanagala is located in an area of severe drought. For months in every year no rainfall occurs, leaving a dry, dusty landscape, Trees, natural vegetation and crops soon wither and die in the heat of the relentless sun. Without permanent water, the villagers were required to walk miles to obtain even the smallest quantity for drinking, cooking and bathing. So, in 2012, Project Sri Lanka agreed to support the families of Handapanagala by providing resources for the construction of a permanent well and water tank. This project has transformed the lives of the village residents who, as well as having adequate drinking water, are now enabled to engage in small-scale highland agriculture, paddy cultivation and sugar cane production. A visit from Trustees in early 2018 was very successful and showed us that the well was full of water and indeed overflowing at times! 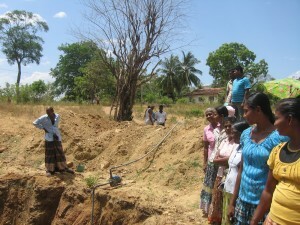 The farmer explained how crucial it was to the well-being of the local families. Peanut plants, coconut trees, papaya trees were all well established and new passion fruit trees had been planted as a cash crop. There was also paddy and rice was seen drying outside the houses.